The property for sale comprises a three bedroomed detached dormer bungalow which extends to c.120sqm and is situated on a good sized site of c.0.23 hectares. The property which is situated in a pleasant rural area comes to the market in need of some refurbishment has nicely proportioned accommodation and offers excellent potential. 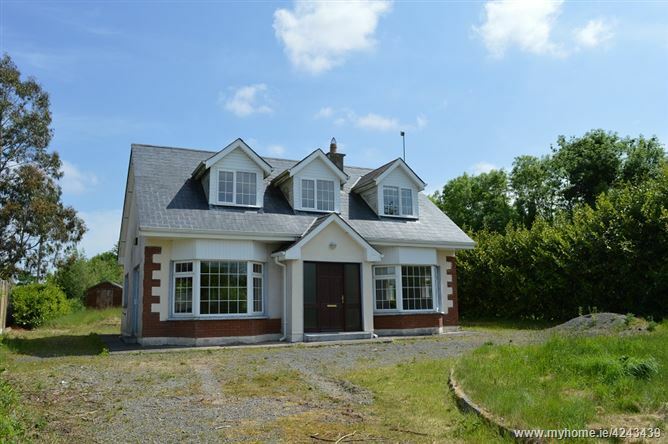 The property is located c. 4kms from the village of Rathnure with local shopping facilities, church and primary school close by. The accommodation briefly comprises Ent Hall, Reception Room, Kitchen/Dining Room & Bathroom to the Ground Floor with Three Bedrooms and Bathroom to the upper floor. Ent Hall: c. 5.5m x c.2.8m with timber floor. Reception Room: c.5.5m x c.3.7m with timber floor, open fireplace. Kitchen/Dining Room: c. 5.5m x c.3.6m with part tiled, part timber floor, fitted kitchen. Utility Room: c.2.7m x c.2.3m with door to rear. Bathroom: c.3.0m x c.2.3m with wc, whb, bath, shower, floor and wall tiles. Bedroom 1: c.3.5m x c.2.9m. Bedroom 2: c.3.1m x c.2.9m. Bedroom 3: c.3.6m x c.5.9m. En-Suite: c.2.8m x c.1.6m with wc, whb, shower. 3 Bed Detached Dormer Bungalow c. 120sqm. From Clonroche Proceed towards Enniscorthy on the N30. After approximately 4kms turn left on to the R733. Proceed for c. 2.7kms and the property for sale is on the right. See For Sale Sign.